From the Antarctic to the North Atlantic, this ship was plagued with problems from beginning to end. The Lyubov Orlova off Petermann Island. Image from Wikipedia. Built for the Far Eastern Shipping Company in Vladivostok, USSR, the M/V Lyubov Orlova was one of four Maria Yermolova-class ships specifically designed for Arctic and Antarctic tourism. Named after a Russian film star, the Orlova and her sister ships offered luxury and comfort to Soviet and foreign tourists alike. Guests looking for entertainment could head to the music room – a 60 seat entertainment space with a bar, dance floor, and full bandstand – while those looking for a quieter way to spend their time could sit in the café cinema. The on-board restaurant, two cafés, and two bars meant passengers never went hungry or thirsty as they watched glaciers, icebergs, and arctic wildlife pass by. The ice class 1A hull meant she could withstand the impacts of Arctic and Antarctic ice, reducing the risk to the passengers and crew and allowing the ship to venture into areas that lesser vessels could not explore. In 1999, she was chartered by Marine Expeditions for trips to the Antarctic Penninsula and underwent a massive overhaul to prepare her for the journey. She was renovated again in 2002 for charters by Quark Expeditions (Antarctic) and Cruise North Expeditions (Arctic). She took hundreds of people to breathtaking sights, showing them the beauty of the poles that only a handful had seen before. Unfortunately, on November 27th, 2006 she ran aground at Deception Island, Antarctica. The ship’s captain was forced to issue a mayday, and Orlova was pulled free by the Spanish Navy icebreaker B/A Las Palmas. Fortunately, the damage was not severe and she was able to make it to Ushuaia, Tierra del Fuego under her own power. After some minor repairs, she returned to regular service. This is when the story starts getting interesting for me, because I remember the Lyubov Orlova in St. John’s harbour. Living through this ‘saga’, such as it was, makes this story all the more surreal. Crew of the Lyubov Orlova. Image from The Telegram. In September 2010, the Orlova sailed into St. John’s harbour. Yours truly had left the province a month before, but I had seen the ship in harbour a couple of times when she was doing the Arctic circuit under Cruise North Expeditions. You can imagine my shock when I saw her photo on the CBC Newfoundland and Labrador news page announcing she had been seized by the federal government and was being held in St. John’s. It soon came out that Cruise North was owed $251,000 USD by the Russian owners of the vessel because of a cruise that had been cancelled due to mechanical issues with the ship. On top of that, the 51-person crew hadn’t been paid for almost six months, so they were substantially in the red. The creditors had gotten sick of waiting for their money, so the ship was seized. The crew was brought ashore, put up a hotel, and St. John’s locals donated food, clothes, and cigarettes to help them out until they returned to Russia three months later. The Lyubov Orlova, listing to starboard in the harbour. Image by Heather Elliott, December 2011. While the crew departed and made it home, the Orlova remained here in St. John’s, tied off just up from what is now Jack Astors and The Keg. Over the next two years, she would go through various states of listing to port, listing to starboard, creaking and groaning and being marked with spray paint by some local pranksters. The Russian owners of the ship said they did not want her back and allowed her registry to lapse. So now, the Orlova was left, no owners, sitting in the harbour. A call was put out for anyone that wanted to purchase the ship and get her out of the harbour. In February 2012 an offer of $275,000 was made for the ship in a Federal Court proceeding. The ship became the property of Neptune International Shipping, and Hussien Humayani, Rezi Shoeybi and his uncle, Saeed Shoeyibi, became co-owners. The team began making arrangements for the ship to be sent to the Dominican Republic to be scrapped. Oh, wait. We’re just getting started. Once the ship was sold, its new owners hired a team from Miami to come up to St. John’s, start the engines, check the onboard equipment and make sure the ship was seaworthy. The team arrived on March 2nd, started the engines, checked the equipment, and left the ship refusing to step back on. Apparently, if you leave a ship sitting empty alongside a harbour for two years with no one doing any sort of upkeep, it can become host to all sorts of creatures – barnacles, starfish, seaweed, and rats. The presence of wildlife was so severe that the only recommendation the team could offer was the entire ship be fumigated. When this was relayed to the owners, they sent money to the team for plane tickets home rather than for pest control. The team was so disturbed that they alerted the Canadian and American Coast Guards to the state of the vessel, just in case it wasn’t reported otherwise. 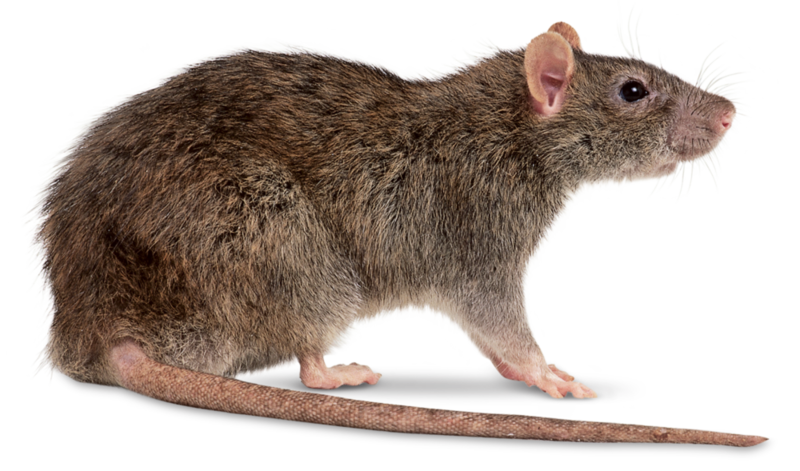 Even the St. John’s Port Authority claimed to have no idea of the level of infestation, stating that, when complaints are made, measures were taken to eliminate the pests. Someone evidently neglected to pass along that memo. The ship continued to sit for a few more months, until December 2012, when the “little tug boat that thought it could”, the Charlene Hunt, entered the picture. The Charlene Hunt in St. John’s. Image from CTV News. I distinctly remember the arrival of the Charlene Hunt. I remember looking at it and thinking “That is a small tugboat. I wonder what it’s doing here?” After a bit of sleuthing (read: I asked a journalist friend of mine), I was told that it was here to tow the Orlova out of the harbour. Sam Shoeybi had chartered the Charlene Hunt and sent the tug, its crew, and his nephew Reza to St. John’s to stabilize the Orlova and tow it to the Dominican Republic. The Hunt was 30 metres long, had a draught of 2.5 metres (forward), and weighed 196 tonnes. Although she was owned by Hunt Marine out of Rhode Island, USA, she was being chartered through a private firm that was based out of Toronto for the Orlova job. The Charlene Hunt’s journey to St. John’s had not been uneventful. Shortly after leaving New Bedford, CT, she suffered a split cooling line in the stern and began taking on water. The engine room pumps kept up for a while, but the master eventually had to put out a mayday. The Canadian Coast Guard airlifted two crew members to safety and the tug was escorted into Halifax. After conducting some repairs to stop the leak, the Charlene Hunt set out from Halifax, making it 12 nautical miles before she had to detour to Sydney with fuel filter and generator problems. After making those repairs, the tug set out again, arriving in St. John’s on December 9th. I just… guys… I can’t. It’s so tiny! Image from Ship Shots St. John’s. The crew set to work fixing up the Orlova, “sell[ing] everything that wasn’t nailed down”, according to The Telegram. Reza acknowledged in an interview that the North Atlantic could be treacherous at this time of year, but that he didn’t “foresee any problems coming up. We already know what we’re dealing with”. Finally, on January 23rd, 2013, the Orlova was taken under tow and both vessels slowly made their way out of St. John’s and into the North Atlantic. Heavy weather greeted the tug within the first 12 hours of its trip, and by hour 27 it became clear that this plan was not going to work out as they had hoped. First, the towline failed off Cape Race, NL, setting the Orlova adrift. Though the crew of the Charlene Hunt tried to retrieve the emergency tow line, sea conditions made it impossible, and for the next day the tug stood by the empty ship, reporting to Marine Communication and Traffic Services regularly on their position. January 25th brought news from the Charlene Hunt that the weather had further deteriorated and ice had begun to build up on the Orlova. On January 26th at 6:00am, the master reported that they had fallen eight nautical miles behind the Orlova and couldn’t keep up with the ship as she moved with the wind and waves. At 10:45am, the Charlene Hunt began taking on water from a broken discharge valve in the engine room, and the tug was escorted by CCGS Cape Roger to Cape Spear for temporary repairs. Due to the deteriorated state of the tug, she was ordered to return to St. John’s. Under tow and underway. Why they were allowed to leave, I will never know. Image from The Telegram. Meanwhile, the Lyubov Orlova continued to drift, unattended, through the waves. The supply ship Atlantic Hawk reported sighting the ship in open water, 85 nautical miles off of the Hibernia oil production platforms. Concerned for the safety of the platforms and their crew, the Hawk took the Orlova under tow on January 30th, guiding the vessel in a north-easterly direction for 44 hours, well away from the platforms. Transport Canada then contracted the supply ship Maersk Challenger to take over the tow and bring the ship back to St. John’s. Here’s where the story gets trickier. I’ve read the Transportation Safety Board report and lots of other articles and documentation related to this incident, and honestly, it’s still not completely clear to me if the following was an accident or deliberate. On February 2nd, 2013, the Maersk Challenger took over the tow of the Orlova and changed course for St. John’s. She was 250 nautical miles out and still facing heavy seas and high winds. Very soon after she changed her course to head for home, the emergency tow with the Orlova broke, setting the ship lose again. After a couple of attempts to bring her back under tow, the Lyubov Orlova drifted into international waters. It was determined by Transport Canada that since the ship was no longer in Canadian waters, it was no longer a Canadian problem. The Orlova continued to drift away, and the Maersk Challenger and Atlantic Hawk returned to their previous assignments. 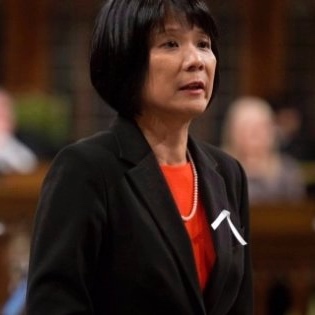 Oivia Chow (NDP) was one of the most vocal critics of the governments treatment of the Orlova situation. Almost overnight, everyone became curious over what had happened to the Orlova. Reports in the media claimed that she was filled with “cannibal rats” heading for the Ireland. The Irish Coast Guard was put on alert, pouring over satellite images and information to try and track the ship down. The Opposition in Ottawa came down hard on the Conservative Government, saying that Canada had truly dropped the ball leaving the ship at sea. Transport Canada said it wasn’t their problem, it was the owners, and that the owner would therefore be responsible for anything that happened to or because of the ship. The owners shrugged their shoulders and said they had their own problems to deal with; they were in debt because of a ship that they could no longer cash in on. It was a total mess. On February 23rd, news came that one of the Orlova’s emergency beacons had gone off, and a second beacon was reported on March 8th. Since these beacons only go off when they come in contact with water, most authorities believed that the ship had sunk. This was highly likely, since she wasn’t in great shape when she left as it was, and the North Atlantic is unforgiving to the best of ships, never mind one that had been sitting derelict for two years. The TSB report found that the master had insufficiently prepared the tug and the ship, and that the combination of the weaker Charlene Hunt and the strength of the sea had lead to the failure of the tow and loss of the Orlova. Although the Lyubov Orlova’s story ended there, her legacy certainly didn’t. A Twitter account was made when she first disappeared, @LyubovOrlovaNL, reporting on the adventures of the “leetle boat” at sea (unfortunately, it’s since been deleted). Ontario rock band Billy Talent, inspired by the idea of a ghost ship of cannibal rats, wrote a song of the same name and released it on their sixth studio album in 2017. The Orlova will always have a spot in my heart. 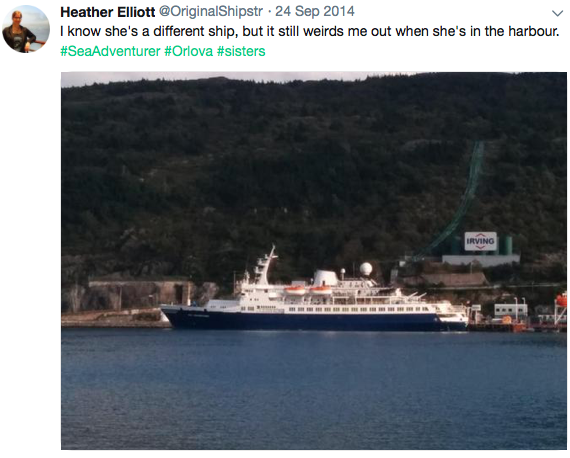 She became a fixture in the St. John’s harbour, and as eerie as she was when she was here, it was stranger still seeing her empty spot along the jetty when she left. Her bad luck seemed to pass along to her sister ship the M/V Sea Adventurer, who went aground off Nunavut and had to undergo repairs. The Sea Adventurer still comes into port from time to time, and honestly, it still weirds me out and makes me do a double take.